We have unreservedly featured Diane Wirth's new book Parallels alongside our top authors and their key subjects. As result of her straightforward and compelling scholarship, we consider that the archaeological establishment, who overturned the concept of diffusionism around eighty years ago, will have to re-write their teaching text books, and join us in exploring the evidence and records on the archaic worldwide civilisations, initially stimulated by the activities of the Shining Ones. The long debated subject of isolationism and diffusionism is brought into the open by comparing the many common traditionsof the Ancient Middle East and Mesoamerica. Parallels is fascinating, scholarly, reader-friendly, and discusses the plausibility of foreigners from the Middle East having an effect on Mesoamerica. "One of the most puzzling problems for culture historians and archaeologists has been how to account for shared similarities in diverse parts of the world," said Brian M. Stross, professor of anthropology, University of Texas at Austin. 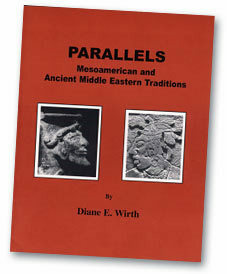 And Robert M. Schoch of Boston University commented, "It is too much for all of this to be dismissed as merely coincidence and independent invention... With this important book, Diane E. Wirth is helping to rewrite not only the history of pre-Columbian Mesoamerica, but the history of the ancient Middle East as well." Topics such as bearded foreigners, fish traditions, creation and re-creation, Mesoamerican & Egyptian scribes, the king and the World Tree motifs, are some of the chapters outlining Wirth's findings. Included in the 211 pages are illustrations, tables and bibliographical sources to help the reader understand and enjoy the text. With a BA degree in Art (most of the illustrations in Parallels are her work), she has studied Mesoamerican and Middle Eastern art for over 30 years. Her travels are extensive throughout the world, especially to the sites in Mesoamerica including travel for 6 weeks with the famed Linda Schele (art historian, iconographer and epigrapher). Wirth has given papers which were read at the Conference of the American Society for Phenomenology, Aesthetics & Fine Arts, Harvard Divinity School, Harvard University; The Ancient American Western Conference, Utah State Valley College; The Society of Early Historic Archaeology, Brigham Young University; and the New England Antiquities Research Association in both New Hampshire and Massachusetts. Wirth has also published numerous articles in magazines and scholarly journals.